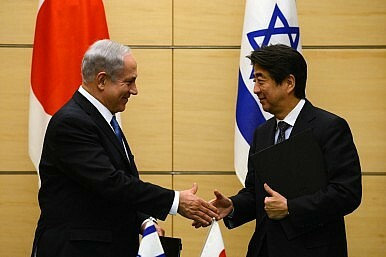 While the agreements are an easy and obvious course of action for Israel, Japan should tread carefully. Israeli Prime Minister Benjamin Netanyahu arrived in Japan on Sunday for a five day visit. He met with Japanese Prime Minister Shinzo Abe on Monday, in talks to boost defense and cyberspace cooperation. At a press conference, Netanyahu emphasized their common challenges, specifically the threat from rogue states with nuclear weapons. The two leaders also signed a joint statement that “expressed their strong hope for the early resolution of various issues of concerns regarding North Korea, including its nuclear development.” Netanyahu also made a clear connection between North Korea’s path to nuclear armament and Iran’s, saying Iran was seeking to ease sanctions while maintaining military capability. The two leaders also signed an agreement to bolster joint industrial research and development, and eventually weapons development. While Netanyahu praised Japan as technological innovator that Israel could learn from, their shared efforts in cyber warfare are likely to benefit Japan more than Israel. Israel played a significant part in the Stuxnet cyber attack on Iran, which later reportedly made its way to China. As China’s state-supported cyber warfare capabilities are already well known, Japan will be looking to find an edge by partnering with countries that have their own cyber expertise. However, publically pursuing that technology could have the unwanted effect of attracting further cyber attacks from China in the short term. Abe also urged Netanyahu to resume Palestinian peace negotiations and advised against “unilateral measures including settlement activities.” Japan has always walked a fine line concerning Palestine and the ongoing sanctions negotiations over Iran’s nuclear program. As Japan imports more than 80 percent of its oil from the Middle East, it can ill afford to upset others in the region. A misstep over the Palestinian issue could affect its relationship with Arabian Peninsula states, and on April 10 and 15 Japan paid Iran $1 billion in previously frozen oil payments, most likely in the hopes of resuming imports as quickly as possible. The details of the meeting between Abe and Netanyahu and their joint statement underscore the level of nuance Japan must employ when broaching such a wide swath of issues. Even while publically Japan has appeared confrontational on security issues with China, Japan can’t afford to provoke it in a sphere like cyber security where China enjoys a clear advantage. Japan also walks a fine line with Iran, because even though it takes a harsh stance against countries developing nuclear weapons in order to strengthen international resolve against North Korea, its energy security is dependent upon the Middle East. As Abe’s economic policy continues apace and a significant resumption of nuclear energy production remains uncertain, Japan’s weakened yen cannot afford any disruptions in global energy markets.